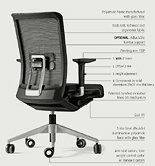 The most organic version of Winner office chair program, the Winner 30 Series, incorporates an innovative-patented mechanism of progressive resistance totally integrated in the seat. Without any manual adjustment, the chair is perfectly adapted to any user position minimizing the user effort when changing from one position to another. 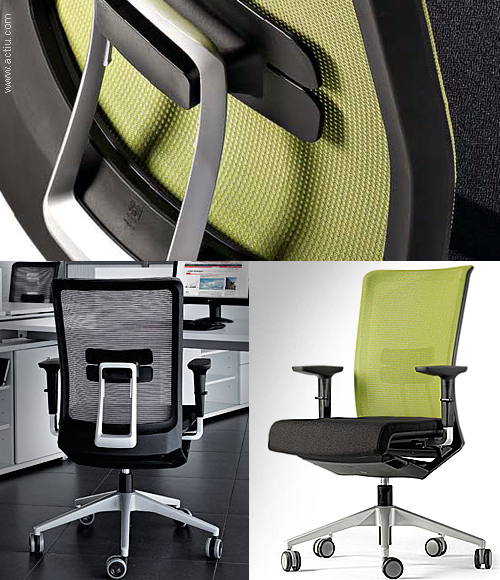 A syncro mechanism detects the pressure over the chair back and adjusts automatically the pressure of the free-floating movement. The seat has flexors to distribute user weight and adapt posture changes reducing circulatory problems. More features are seat slide, double knee-tilt system to control backrest, adjustable arms and wheels with automatic brakes. The chair has engraved symbols and Braille on all levers for those with sight problems. Winner office chair. Ergonomic efficiency. Green Building Certificate Leed Gold:. The office chair are looking marvelous.Thank you for letting me to know this.I look forward your blog to know more like this. Stunning! I really like chairs that are not only equipments but a total companion in facing daily work pressures. It is nice to have a chair that supports your back very well when you need to lay your back whenever that will make you feel more comfortable. I like chairs that can be rolled to nearby areas to easily reach things without having to actually stand up to get them. These are few of the things I wanted in a chair, and the winner 30 has it.